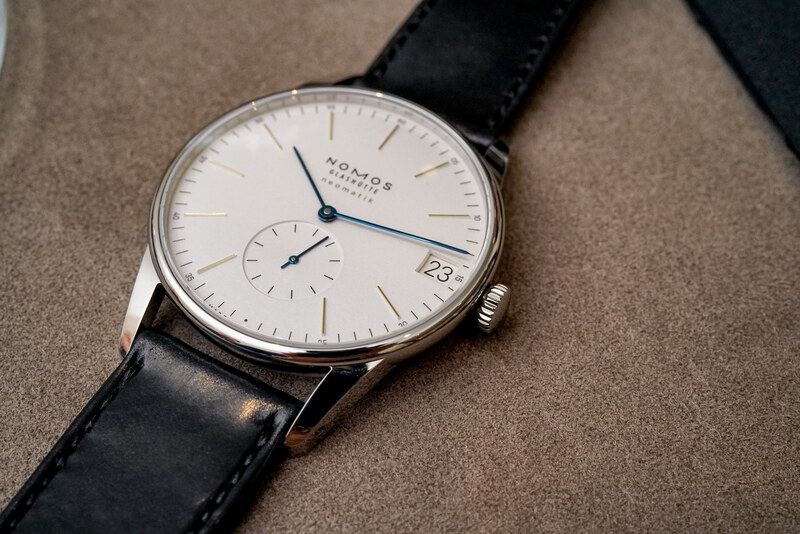 With re-issues remaining white-hot at Baselworld, it could be argued that most brands played it relatively safe, but Nomos has never been counted amongst 'most brands.' This year's leading novelty for Nomos is possibly one of the brand's most daring, particularly when you take into account the deviation from its traditionally minimalist, Bauhaus aesthetic. Yes, the new Autobahn is without question, still a Nomos, as it takes the racetrack inspiration to new territory with a deeply curved dial arced with eight luminous rectangular blocks designed to resemble a speedometer. The needle handset, curved running seconds subdial and 'three-lane' date aperture at 6:00 continue the cohesive theme, dreamed up by acclaimed German interior and furniture designer Werner Aisslinger. 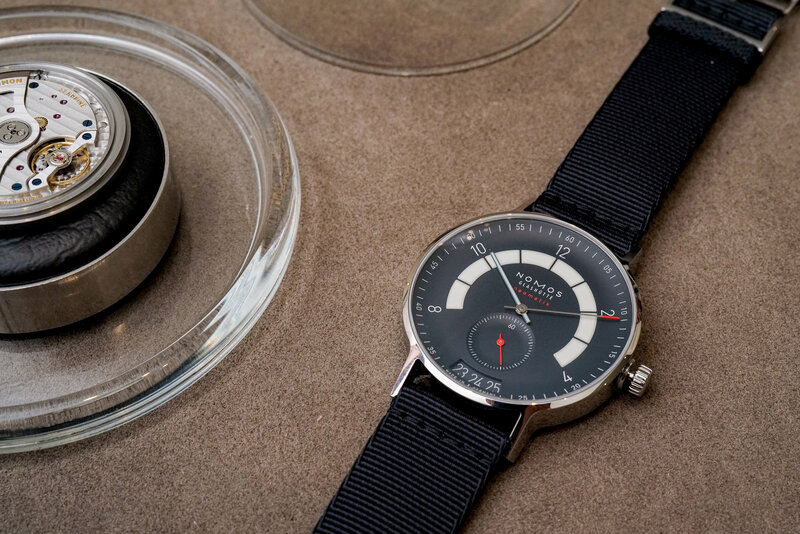 In the true spirit of Nomos, the 41mm Autobahn is an unquestionably fun watch, and one that nicely deviates from the typical hyper-racy or masculine aesthetic found on many motor racing-inspired watches. 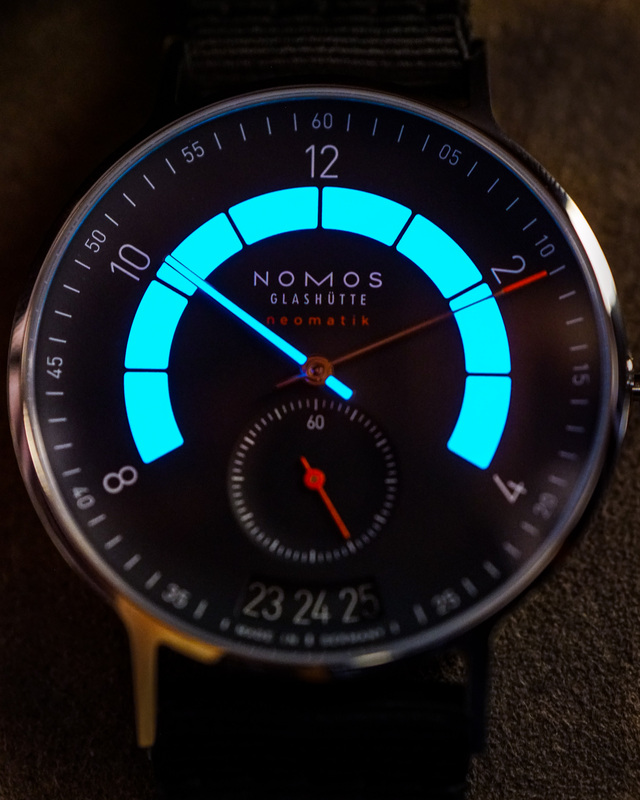 All three of its dial options look equally amazing at night – short of a fully lumed dial, it's by far the most luminous watch currently available from Nomos. We snuck the Midnight Blue under the table for a lume shot, and, well, just see for yourself! If it's subtlety that you prefer, we'd recommend ref. 1301, whose white dial nicely camouflages the luminous plots. Inside the Autobahn beats a brand new movement from Nomos: the DUW 6101, which not only utilizes Nomos' patented Swing System balance spring, it's also the brand's very first Neomatik movement with a date. 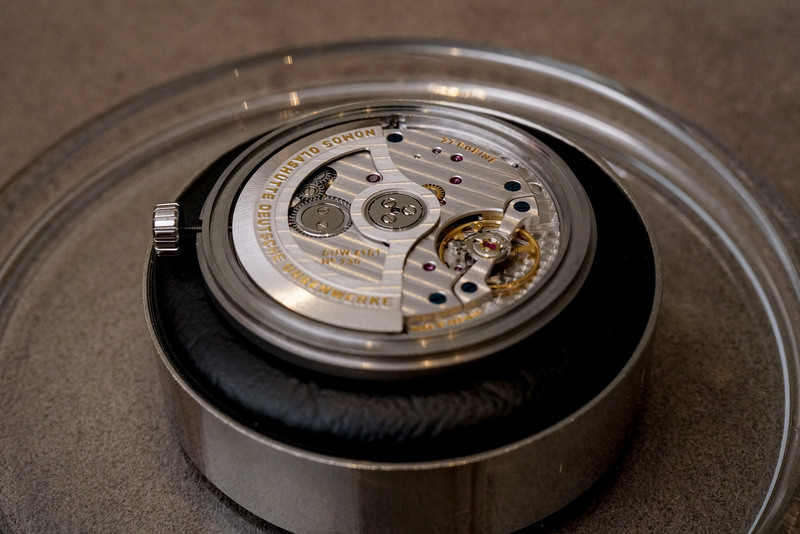 Measuring a mere 3.6mm thick, the 6101 is a broad calibre, putting the date aperture at the outer fringes of the movement, and is noteworthy for its bi-directional quickset date function, which can be set by rotating the crown in either direction from the first position. Also carrying that new Neomatik movement are three new Nomos watches – and Nomos saw fit to start with its three signatures: Tangente, Orion, and Ludwig. However, each of them deploy the 6101 in slightly different ways. The Tangente is perhaps the most unique of the three, using a playful new date circuit, which highlights a colored oval corresponding to each date running around the dial – sort of like a pointer-date, but with a bit of dimensionality to it. 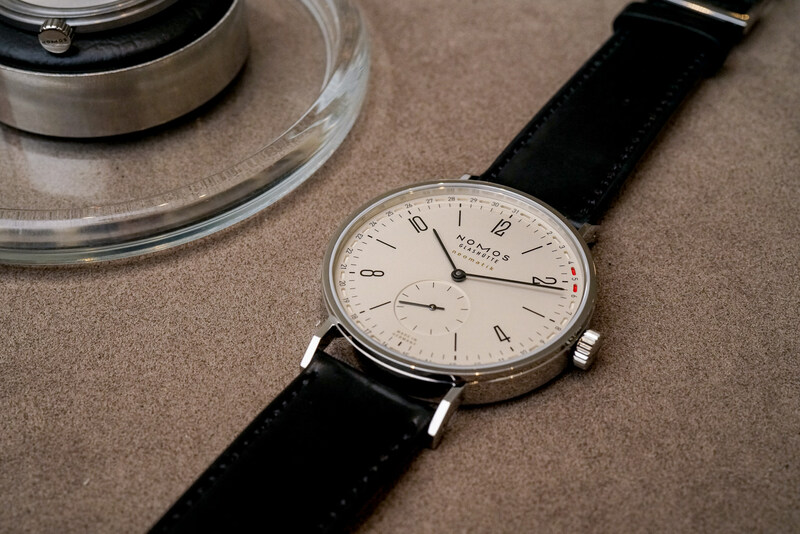 Like the Autobahn, this Tangente utilizes Nomos' 41mm case. The Orion and Ludwig however, both use a more traditional square date aperture, but in two different positions: 3:00 and 4:00, respectively. If you're familiar with Nomos' 41mm case size, all four of these options shouldn't present any sizing surprises on the wrist – here, you can see they wear quite comfortably on my 7" wrist. 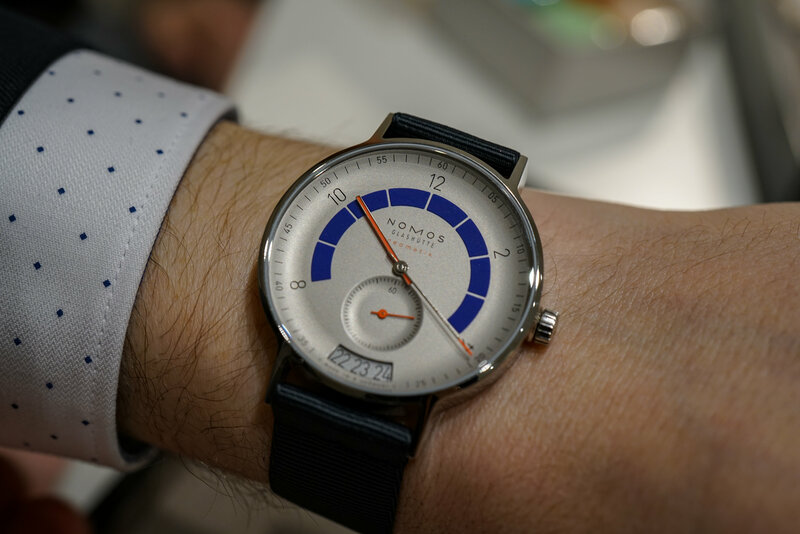 So what do you think of the new novelties from Nomos? 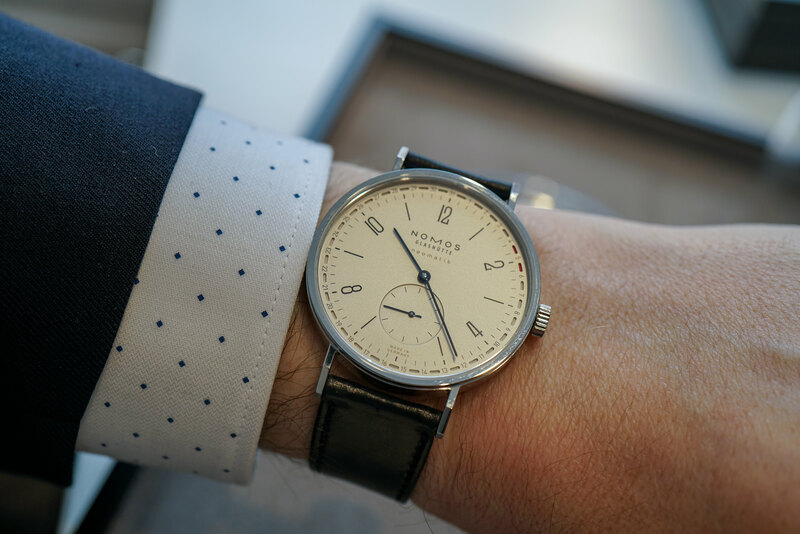 Stay tuned for more in-depth impressions on the collection, including a pair of overview videos featuring Nomos' North American Vice President Merlin Schwertner. 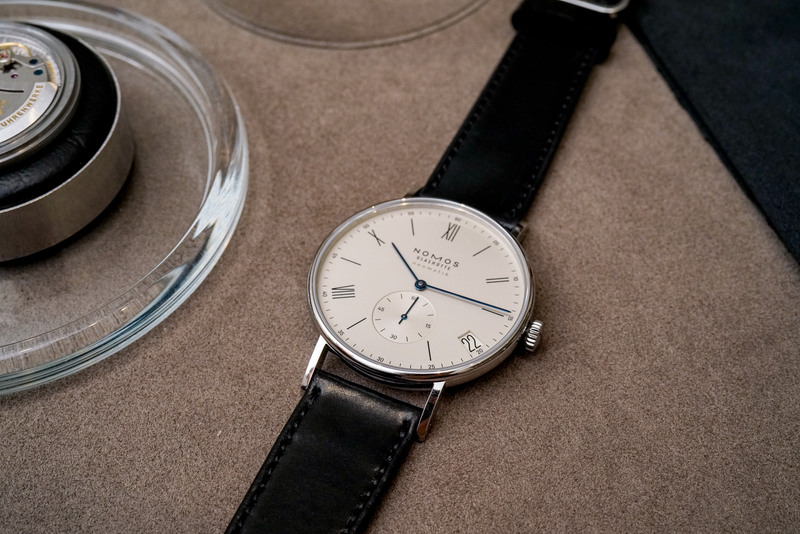 If you have any questions about the new Nomos models, or are interested in pre-ordering one, email us at info@topperjewelers.com. You can also just visit our new Pre-Order Central page to reserve one online. If you don't see your desired watch in the Pre-Order Central, don't worry, just call the shop at 888-730-2221, and we'll be happy to assist you. For the latest in the rest of Topper's show coverage, head over to our Baselworld 2018 page. 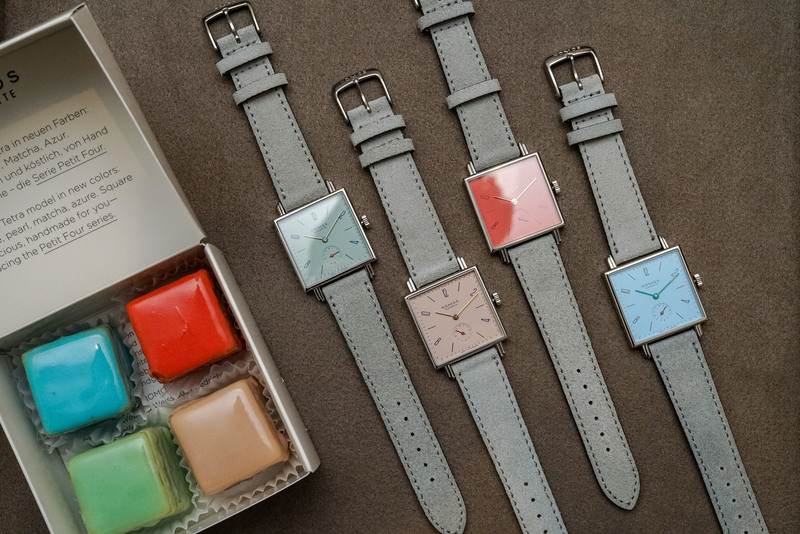 Photos by Topper friend and ablogtowatch contributor Zach Pina - follow him here.